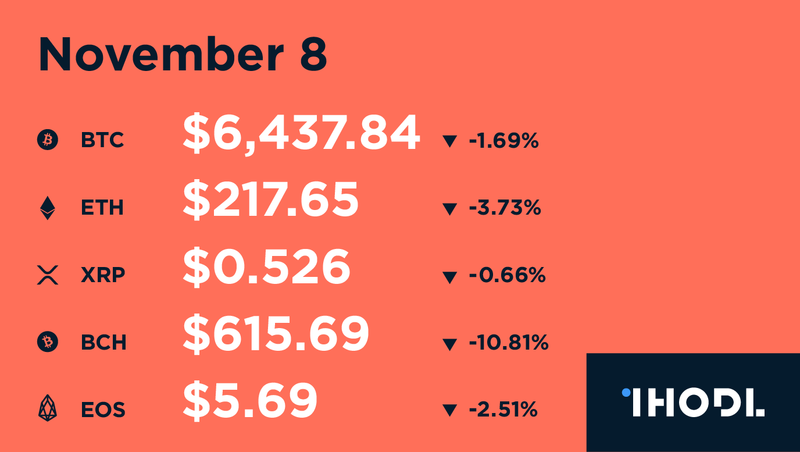 At 07:00 (GMT) total cryptocurrency market capitalization stands at $215.77 billion. MetaMask wallet enhances protection with a ‘Privacy Mode’hich is set to further protect the users of the ethereum blockchain. Abu Dhabi Securities Exchange (ADX), the largest stock exchange in Arab World alongside ISSA intend to set up crypto asset infrastructure and promote blockchain. Taiwan has officially ordered that crypto trading platforms should use real names, as country ups the fight against money laundering and terrorism. BBVA bank has issued a $150 million syndicated loan and recorded the transaction data on the blockchain, in the first of its kind. Group-IB research grades crypto exchanges by security level, first place goes to Kraken, OKEx at the bottom of the list. Mike Lempres, Mike Novogratz, Margot Edelman and Philip Rosedale will participate as judges at the EOS Global Hackathon in San Francisco on November 10-11.